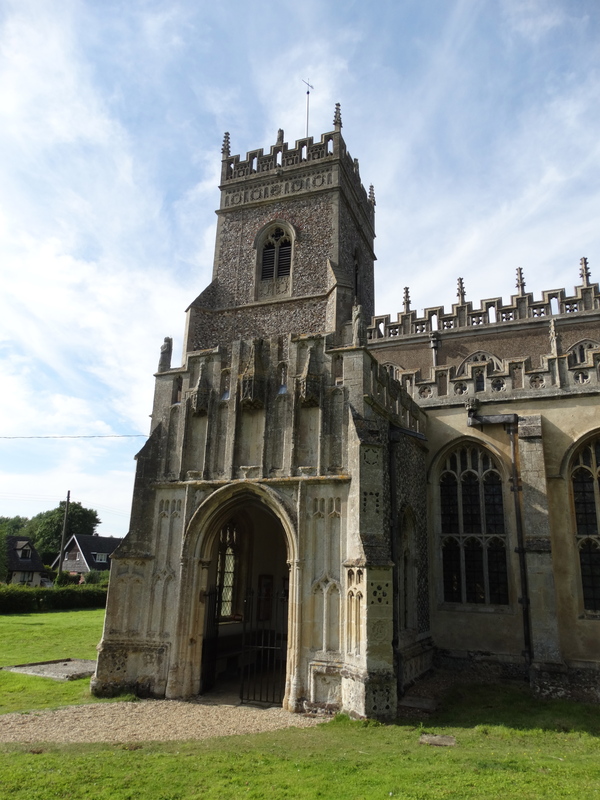 Hessett is just a mile or two down the road from Beyton, and the church is opposite the Five Bells pub. 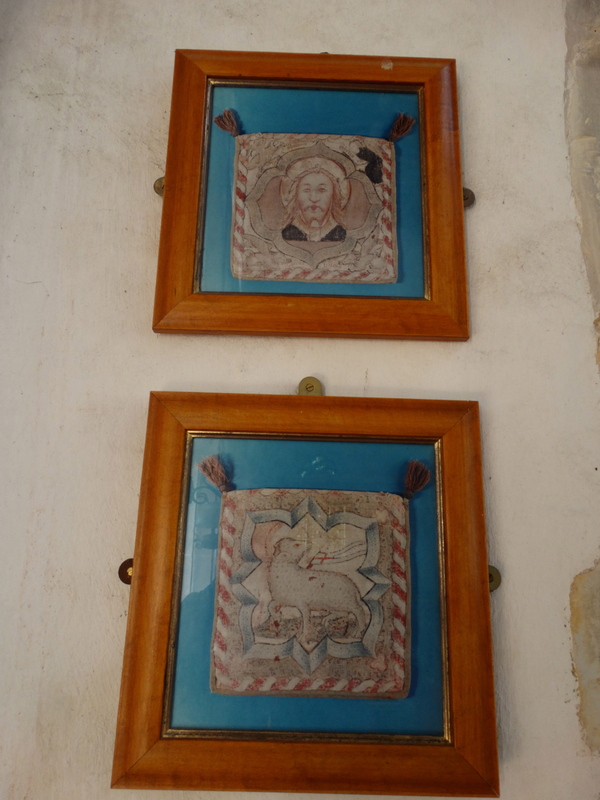 When we were here it was a smashing place to eat – we entertained lots of our fellow clergy here. Indeed, it was here (and back at his house) that my wife beat an Archdeacon in a whisky drinking competition. (Mrs Archdeacon was not amused!). 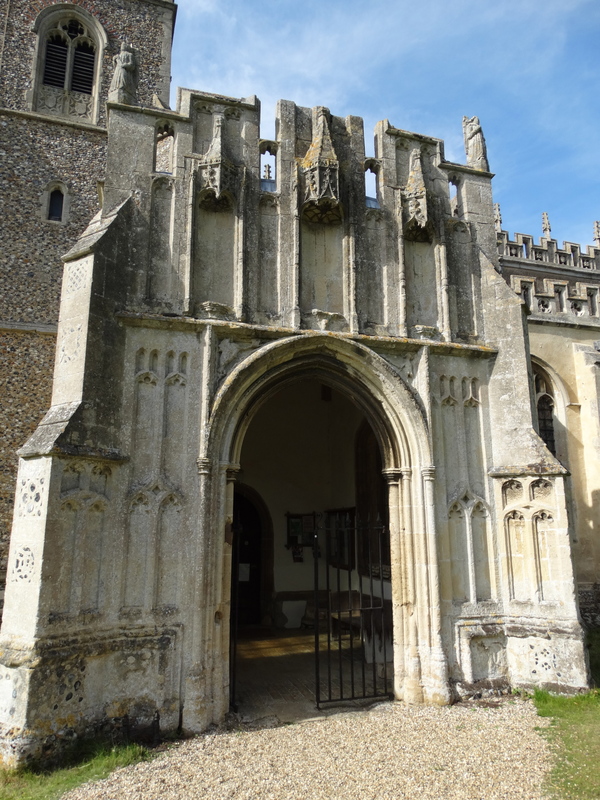 An early C16 porch – rather magnificent. The tower is, to quote the guide, “handsome though not very lofty. 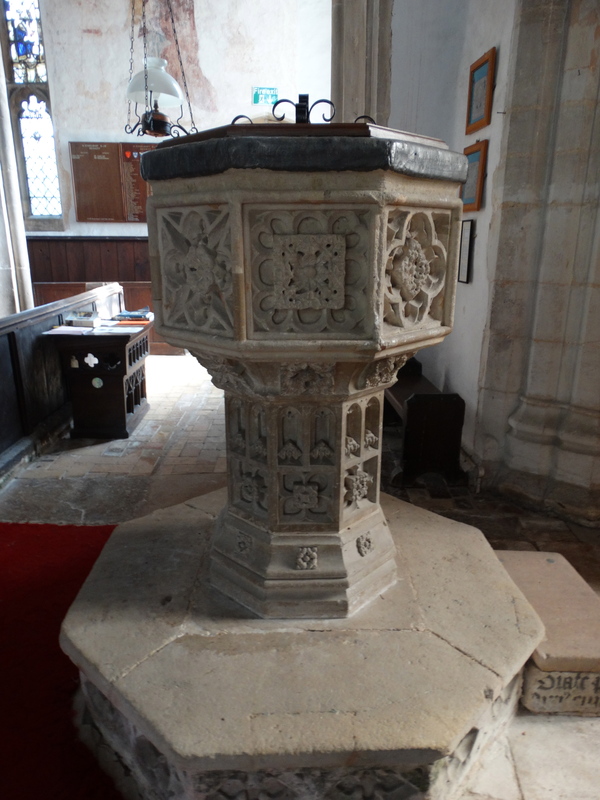 It is nicely proportioned and contains more superb stonework. It is probably the old 14th century tower which, in the 15th century was restored and given a facelift. 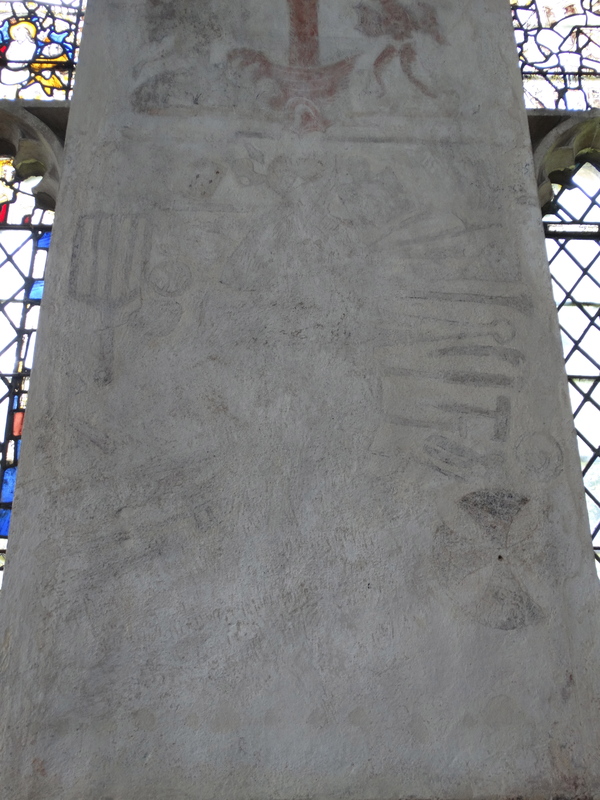 … The lovely stone parapet seems to have been added last possibly given by John Bacon who died in 1513, because of the initials which appear on the shields.” The same initials appear on the porch. 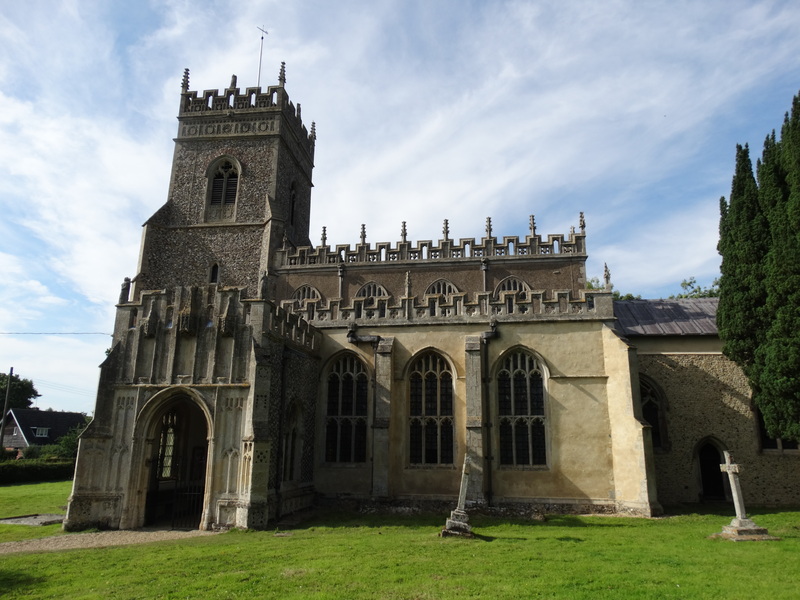 In 1005 the parish was given by Earl Ulfketel to the Abbey of St Edmundsbury. There is a C15 preaching cross in the churchyard, which I missed. 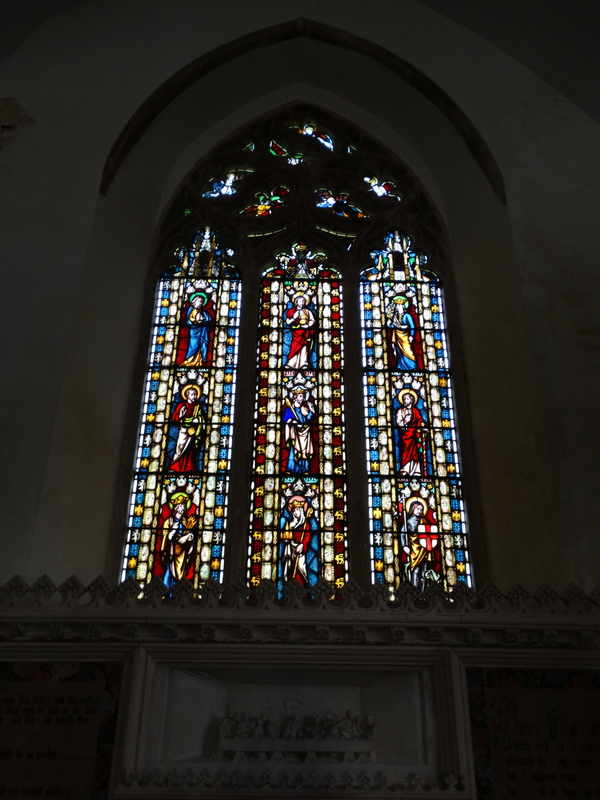 The earliest part of the current church is C14 Chancel – Decorated style in the East Window. 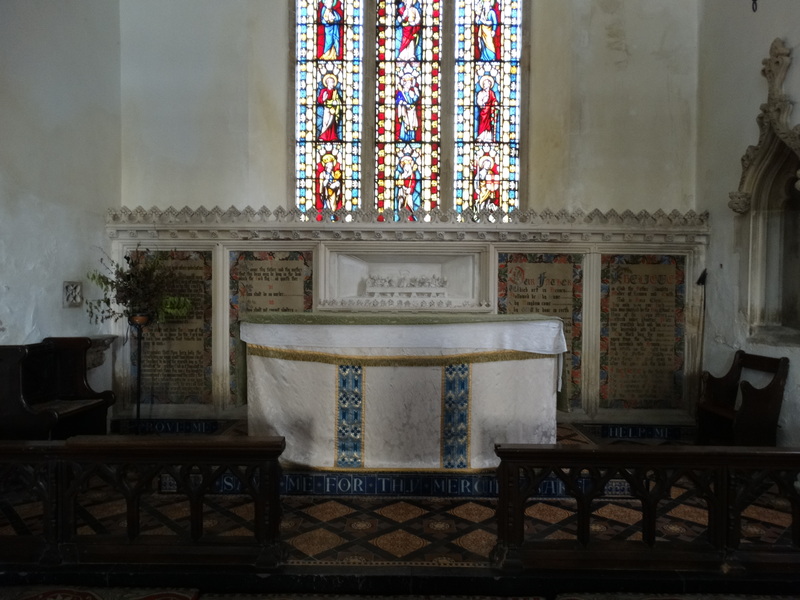 There is a squint in the north wall and a restored piscina to the left – and I should have looked more closely at the benches and Chancel woodwork (I committed the sin of only reading the guidebook when I got home). 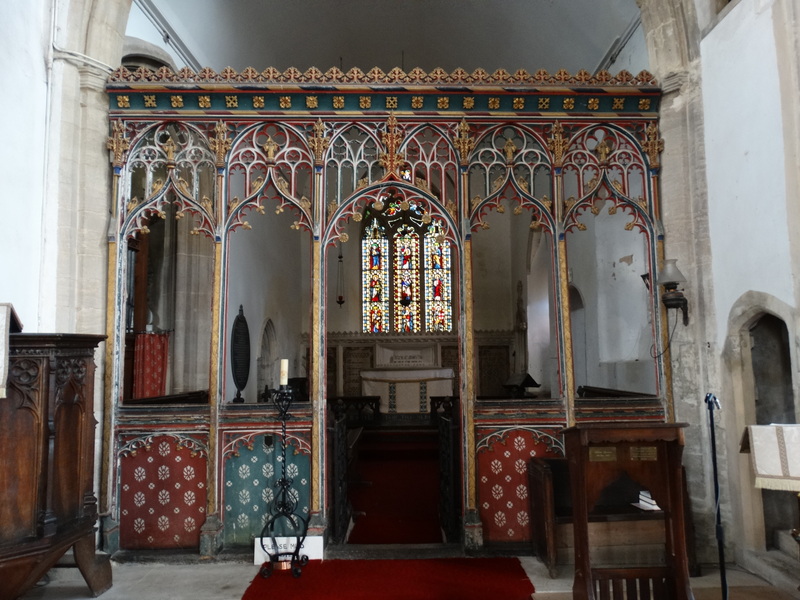 Dividing the Chancel from the Nave is a beautifully painted rood screen. 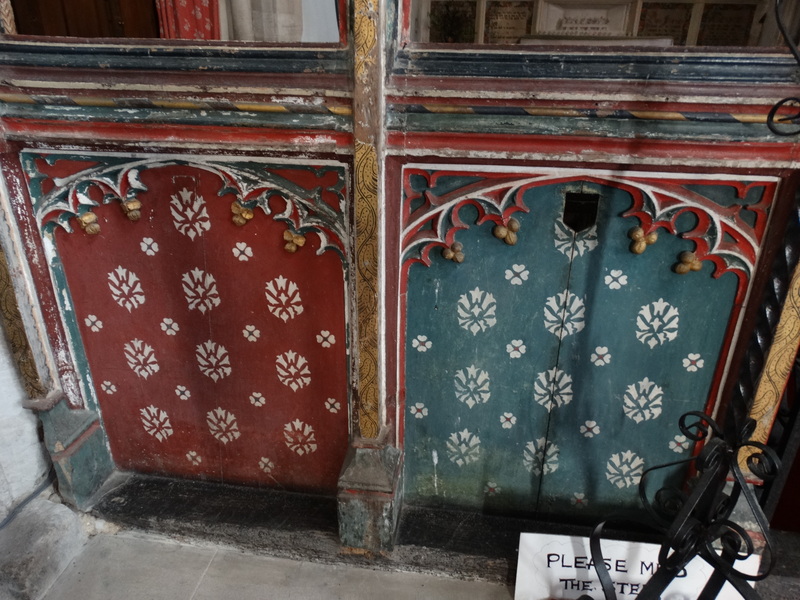 Late C15 – a reminder how colourful our churches were. 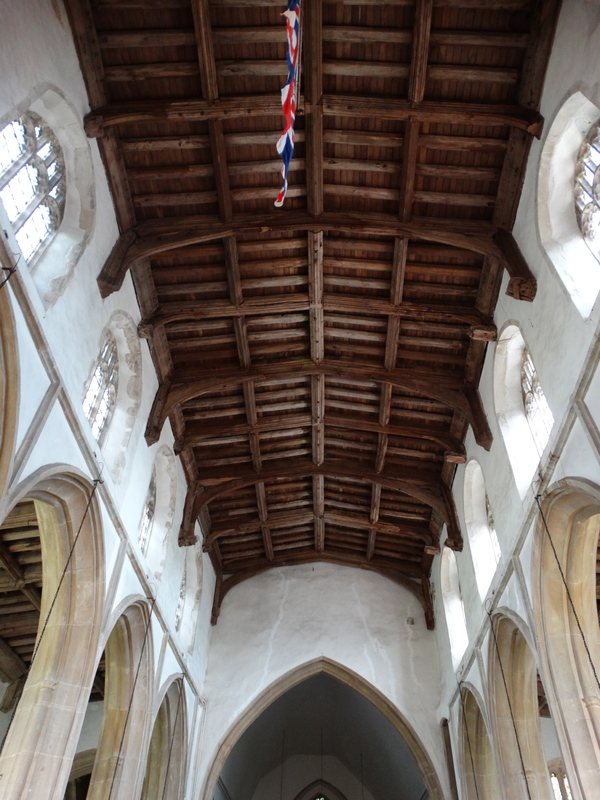 If you stand at the Chancel step and look west you can see the C15 Nave and aisles – Perpendicular style. (If you want a good glossary of church architectural terms, I recommend this Norwich churches site). 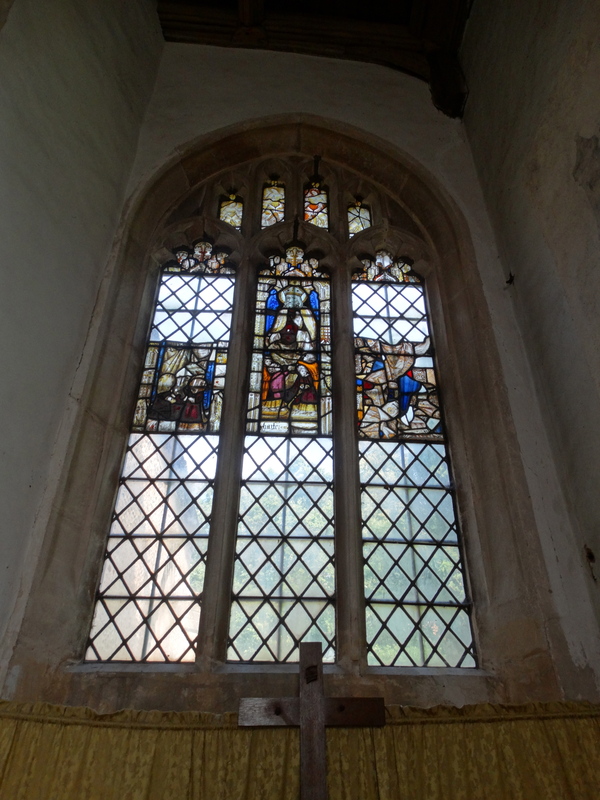 The font was made in 1451 in Norwich and there is some mediaeval stained glass remaining in the windows. 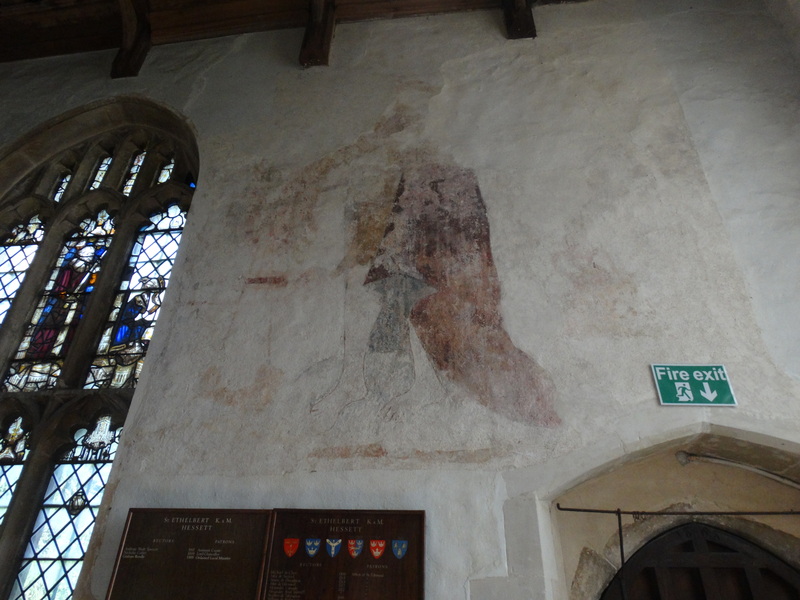 Most stunning of all are the wall paintings. 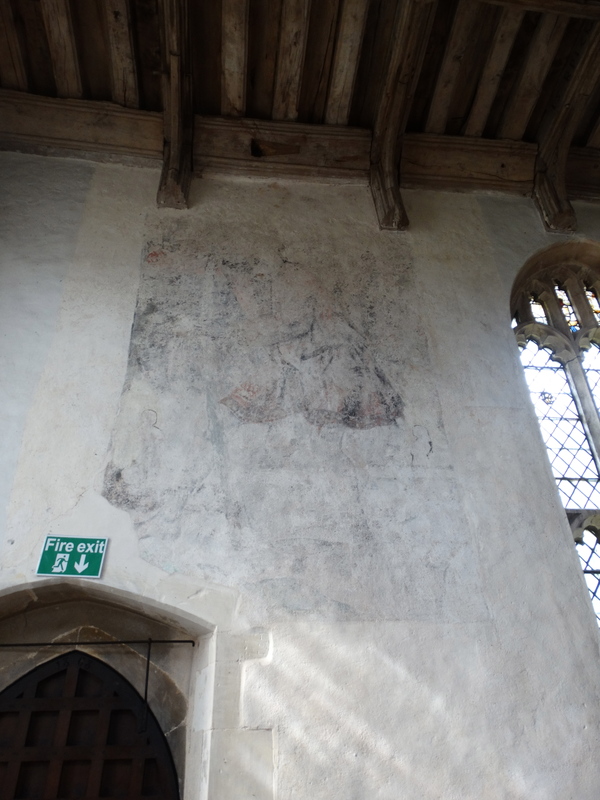 We have St Michael above the South Door who is apparently wearing a feather tunic and weighing a soul in his balance scale. 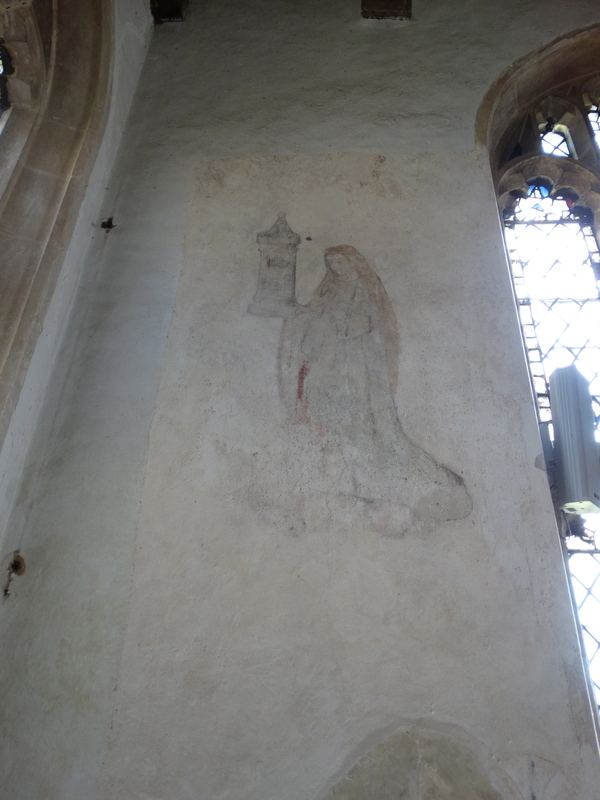 St Barbara is in the South Aisle – she is holding a tower, having been killed by her pagan father for adding a third window to her tower in honour of the Trinity. She is, therefore, the patron saint of architects. Her father was killed by a thunderbolt, so Barbara is also the patron saint of the Royal Artillery and other concerned with explosives! St Christopher carrying the Christ-child through the water, above the north door. 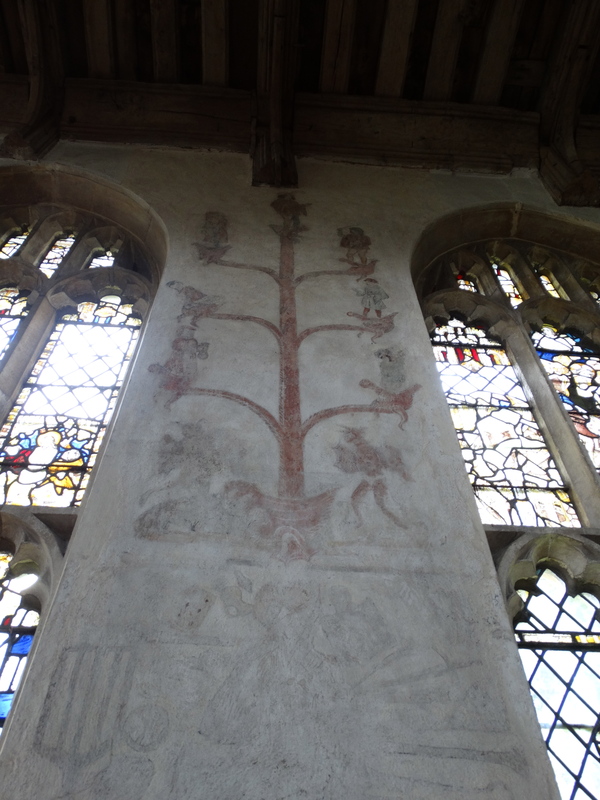 Then we have the Seven Deadly Sins, the earliest of the wall paintings, probably circa 1460. A branched tongue rises from hell with two demons at the bottom – note the underpants. Pride at the top (in all his finery), lust (a couple kissing), anger (with switch and dagger), sloth (falling asleep on his perch), envy, avarice (holding his tightly closed purse), and gluttony (with a haunch of meat, or possible a bottle). Underneath is Christ of the Trades. 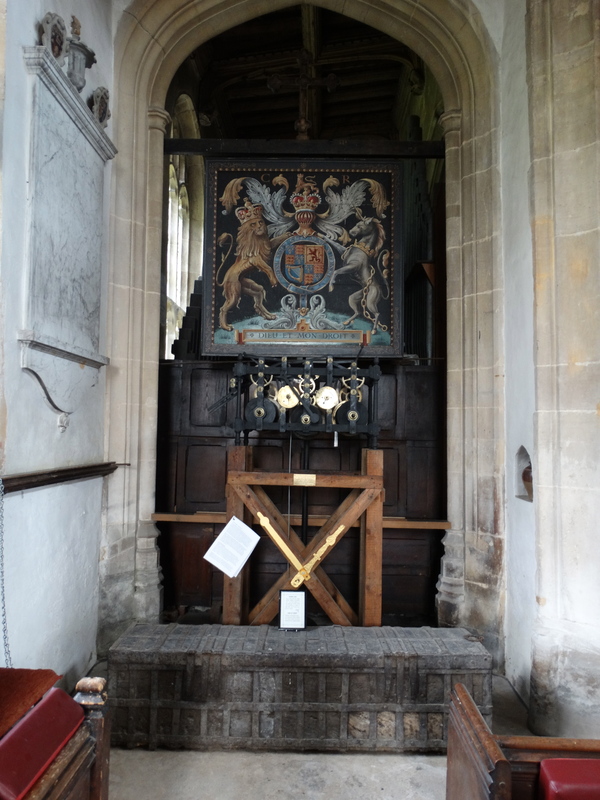 Apparently this has 38 different symbols – no, I won’t list them all. At the east end of the north aisle is an interesting collection. The Parish Chest was used to store valuables. When Cromwell’s men arrived the villagers gave them the three keys required, but not the iron bar needed too. This meant that the pyx cloth and burse were kept – now in the British Museum. The Royal Arms are of Charles II. 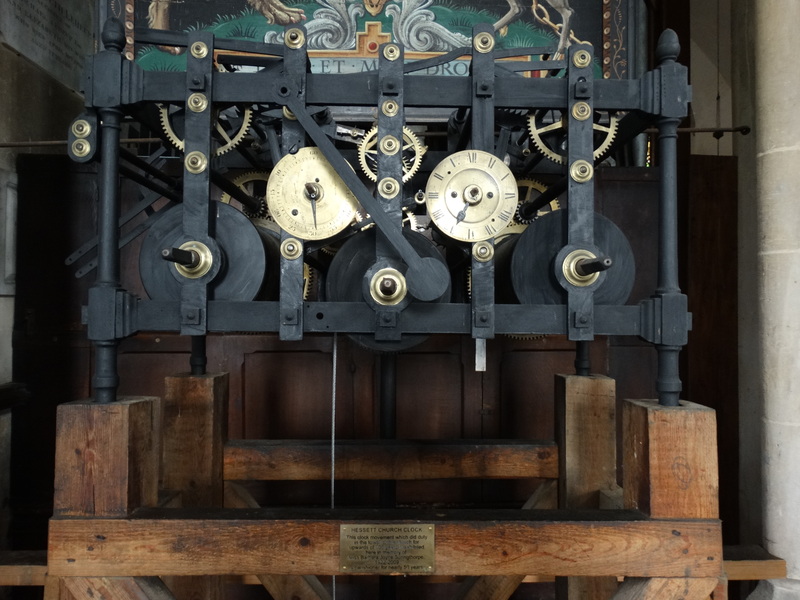 The clock mechanism worked the clock for 150 years until 1972. 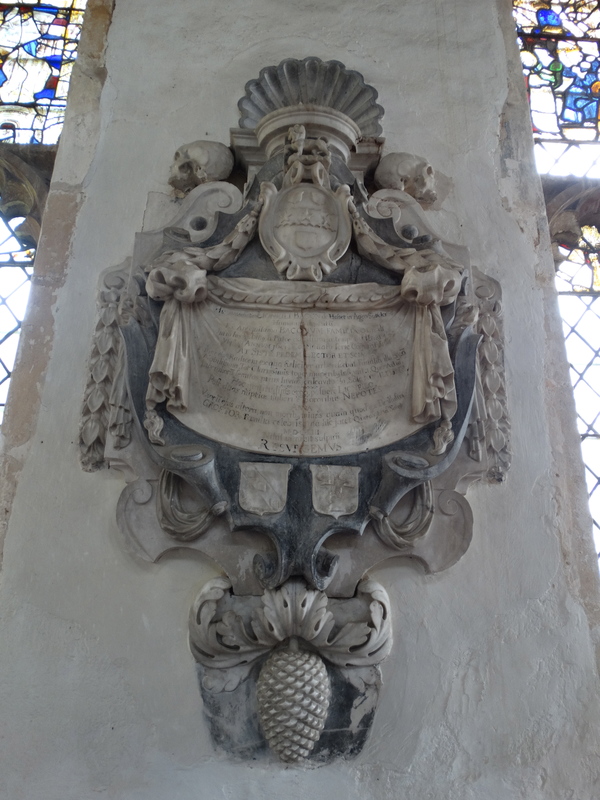 Finally, a rather nice memorial – but who is it to? I didn’t make a note, and can’t work it out. I feel that this blog post is not up to what I hope is my usual standard – and it is a long way to go back. Sorry! 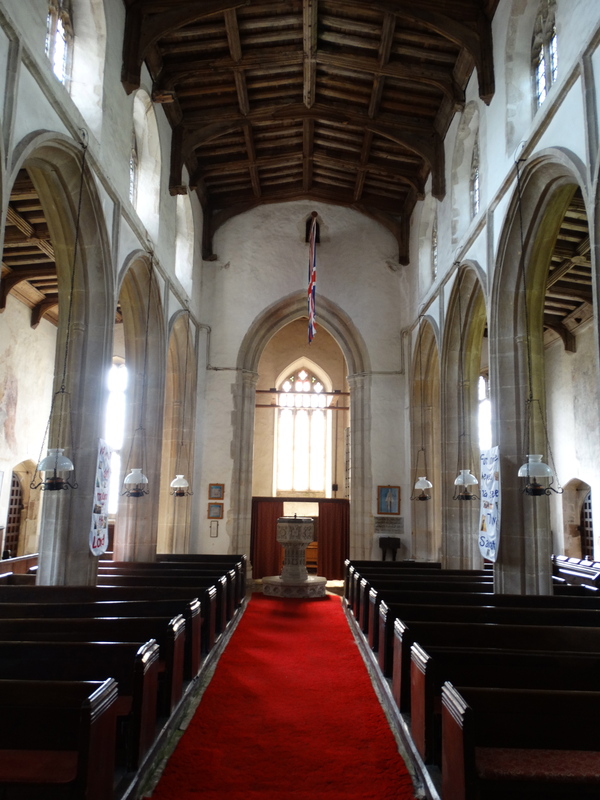 I do recommend you look at Simon’s Suffolk Churches as he has some marvellous photos of all the things I missed.